Ecuador flower farms were the destination of globe-trotting floral-industry expert Terry Johnson as he traveled to South America to report on the topic for Florist Chronicles. This is the third of several stories describing his journeys. 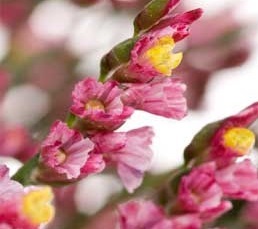 If you missed the first two articles, take a look at Flowers with Love and Roses from Living Soil. Flowers grow abundantly throughout Ecuador. Yet the country’s cut flower-growing community is most well-known within the floral trade for focusing on and producing incredible roses — large blossoms, thick, long stems and an amazing assortment of varieties and colors. But one flower farm, Valleflor (Puembo, Ecuador), chose a different path from other farms in nurturing the growth of some different blossoms. And that, as in Frost’s poem, has made all the difference. 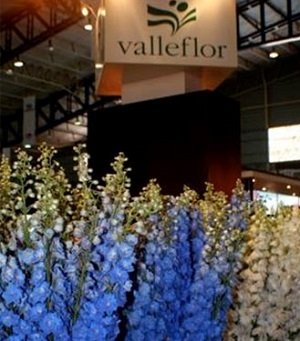 Valleflor’s Delphinium Royal varieties of flowers grow into blossoms with deeply intense, vivid colors and have more blooms per stem than other cut flower varieties. They were also developed for longer vase life so people can enjoy their colorful displays of flowers for many more days. Second on my list of favorites is a far-lesser-known flower: eryngium (air-RIN-jee-um). Eryngium is in the family of Apiaceae, a family that features hairless and usually spiny leaves and dome-shaped flowers (actually flower clusters or umbels) that remind me of thistles. Valleflor describes its eryngium as a “New Age” flower. I don’t know about that, but I know what I like — something different with a long, long vase life. The longer, the better. And eryngium certainly has both distinctiveness and vase-life longevity. Valleflor prides itself on ensuring its flowers grow in harmony with society and the environment, while also protecting the well-being of its more than 220 employees. All employee meals are prepared and served in a stunning, red building with a spotless interior and a terra-cotta-tiled floor and wooden tables and chairs. The monthly cost for those meals is about what we would pay for a cup of premium coffee in the United States. Taking a road less-traveled with a mission of producing the newest varieties of excellent-quality summer cut flowers has not only resulted in some of the finest summer flowers I have ever seen, but it has paid off with many Valleflor customers beating a path to its door.